I think that the Earth Defense Force series is one of those games you either get or you don’t. 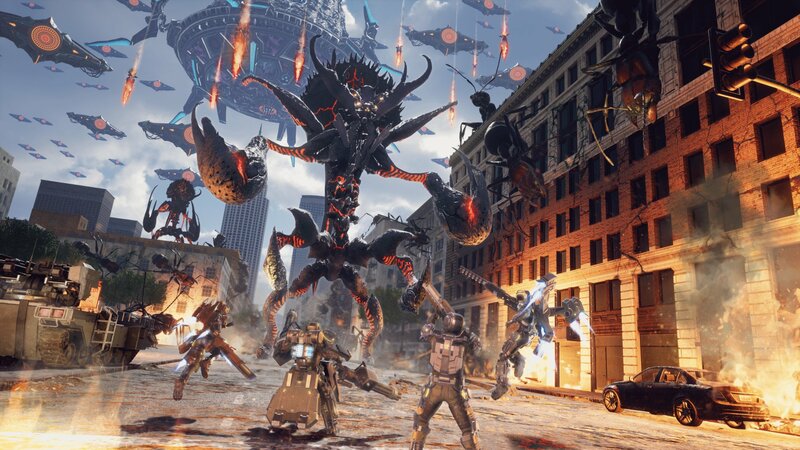 You either understand what’s great about an arcade-style third-person-shooter that lets you blow up giant insects in a chaotic fervor or we probably just don’t get each other and never will. I don’t think I’m alone in the sentiment either. While the EDF series may never have the reach of some other titles out there what it does have is a very dedicated, nearly cult-like following of adoring fans. That following has only grown over the years as the game has improved. 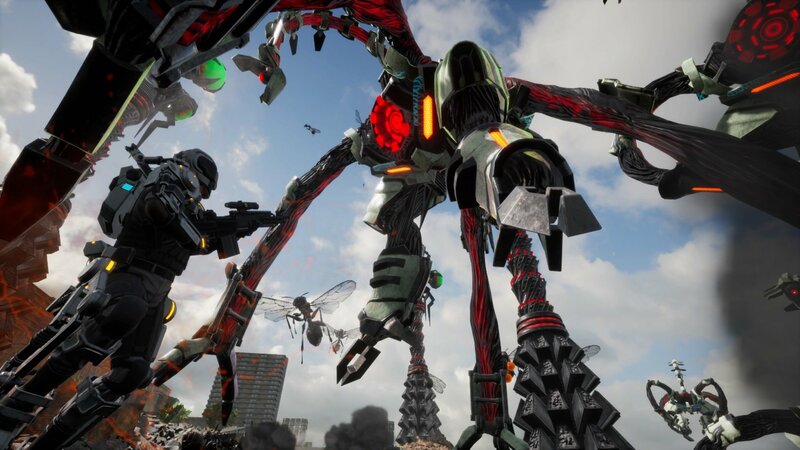 Now, we find ourselves here on the precipice of an entirely new era for EDF as Earth Defense Force: Iron Rain launches onto the PS4. Iron Rain isn’t so much a new chapter for EDF as much as it is an entirely new story made with a western gaming audience’s tastes in mind. In many ways, Iron Rain succeeds at delivering key new features and details that fans will be excited to experience, but at the same time, multiple aspects still stay the same for better or for worse. As is the custom for EDF games, the plot is light and campy, although admittedly the story is much more present in Iron Rain. Players take on the role of a legendary soldier who survived a key battle against an alien invading force seven years ago known simply as the "Closer." Since that time, the Closer has been in cryogenic suspension awaiting a moment when once again their special skills and one-of-a-kind physical augmentation gear (PA-Gear) would be needed to protect the homeworld. Now, the Closer has awakened to once again battle the mysterious alien aggressors as well as a rogue faction of soldiers known as the Kindred Rebellion. Iron Rain does deliver one of the most enjoyable and extremely challenging experiences that I’ve ever had with the EDF series. It doesn’t reinvent the wheel or anything like that as far as gameplay or mechanics go, but it does make some great tweaks here and there that makes it one of the most notable entries in the franchise’s history. This is still a game that’s primarily about blowing up bugs, aliens, and kaiju, but there’s a lot more customization as far as how you go about doing such things. With the exception of the Prowl Rider, EDF fans will be more than familiar with Iron Rain’s character classes: The standard run-and-gun Trooper, the high-flying Jet Lifter, and the dual-weapon wielding tank known as the Heavy Striker. One thing Iron Rain does very well is building you up to unlocking the more nuanced classes as you progress through the campaign. Usually, players have to have to start from level one when switching classes, but now everything is tied to your character instead of the class itself which allows for even more customizability. As I’ve said before, the core concept behind the gameplay is basically the same as ever: Kill all the things in an action-packed frenzy of exploding monster bits. However, EDF: Iron Rain is the most challenging the series has ever been, and it’s not like it’s known for being a walk in the park to being with. Players will have to think much more carefully about what load outs to bring into the fray and how to approach a situation. Learning when in a mission to go all-out with an over-drive ability is another key factor in level strategy. EDF: Iron Rain is definitely a game that will offer up single players a grueling challenge even on normal mode, but these games were never really meant to be played solo. Because of the extra challenge, Iron Rain has even upped the co-op player count from four to six. Any time I can get more friends in on the fun in any game it’s a welcome addition and in the case of Iron Rain, you really get the full experience playing with a squad. As far as I know, this is also the first EDF to feature PvP in the form of Mercenary mode. Right now there’s only one game for it called Scavenger. It pits two teams with up to four players each against each other in an arena full of creatures. Players must collect the gems that the creatures drop and then deposit them at certain locations on the map to earn points. The team with the most points wins that round and the first team to win three rounds takes the match. As the rounds progress the enemies get tougher and the time decreases making it even harder to score. Playing PvP earns mercenary points which can be used to unlock new online titles that come with bonus currency to use in the campaign. 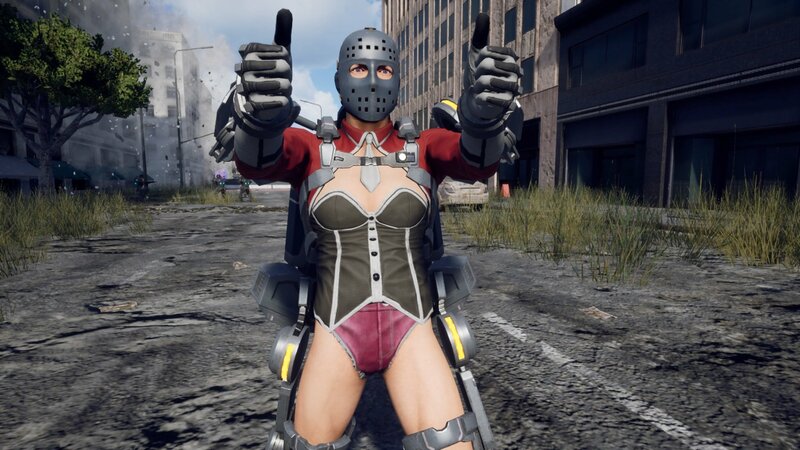 While adding a PvP mode was a nice touch, it’s rather mediocre in its execution. Still, I’m not going to knock a game for trying or adding what I would consider to be bonus content. This is also hands-down the most gorgeous EDF game I’ve ever seen. Many levels were modeled after US cities this time around and resemble things like an abandoned San Francisco overrun with giant ants, a Seattle buried in sand dunes, or coastal beach being invaded by a giant kaiju. One level feels like a nice homage to the classic video game It Came from the Desert, which just also happened to be about a giant bug invasion. 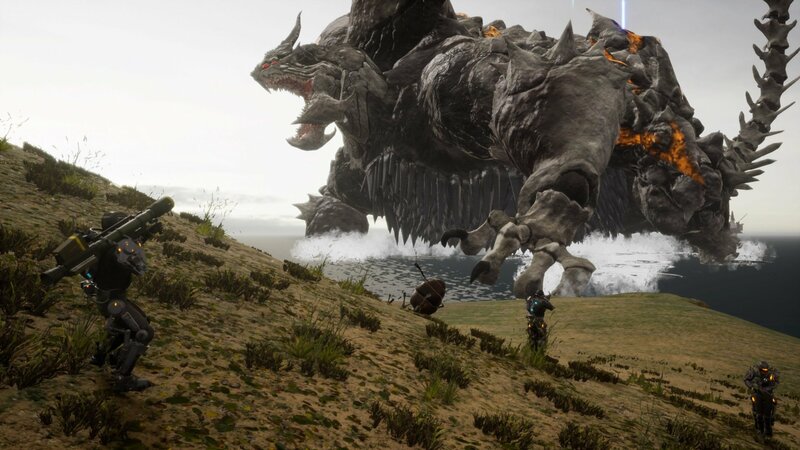 Earth Defense Force: Iron Rain stands out to me as one of the most enthralling, challenging, and gorgeous entries in series, if not the most. It does have some glaring flaws, like the imbalances in the new currency system. Balancing issues like the Jet Lifter running out of boost too quick, or how long it takes the meter to recharge after overheating. I also experienced several crashes while playing. This review is based on a PS4 digital copy provided by the publisher. 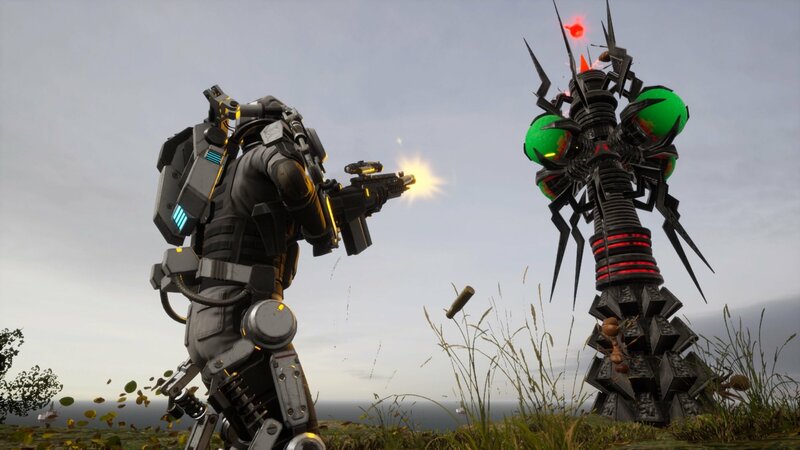 Earth Defense Force: Iron Rain is available now on the PS4 exclusively for $59.99. The game is rated T.
I have been playing it to help Blake with his review. It is the best EDF game in a lot of ways.